UPDATE – Bidding did not hit reserve the first time around so this chicken has been relisted here on eBay with no reserve! FROM 12/29/18 – When it comes to storage environments, a temperature and humidity controlled garage would come close to the ideal environment in which to store your classic. Somewhat less than ideal would be a chicken barn. 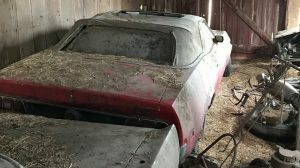 That is where this ’76 Trans Am spent a number of years, but at least it was a dry chicken barn, and the car seems to have survived the ordeal reasonably well. 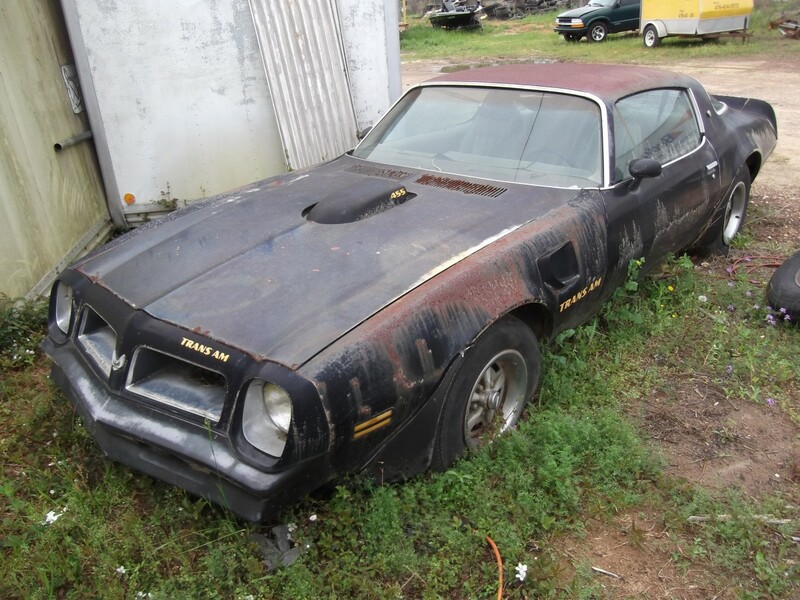 The Trans Am is listed for sale here on eBay and is located in Honea Path, South Carolina. 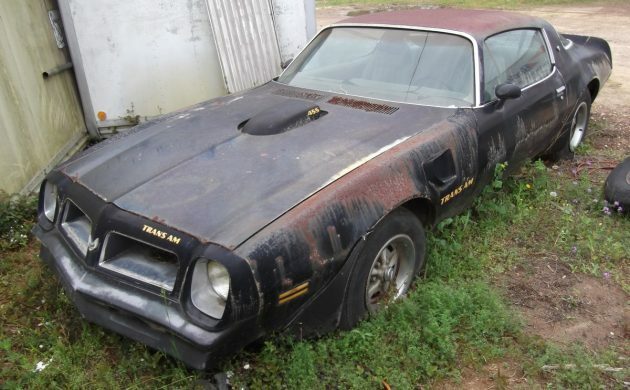 The Trans Am is fitted with the Y82 pack, and the owner claims that this particular car is 1 of 1,628 Hardtop versions built in 1976. This is correct insofar as this is the number that was built with the Y82 and the 400ci engine. It also makes it the most common configuration to be built, while the rarest is the 455/4-speed with the Hurst Hatch, with only 110 of those rolling off the line. While some of the photos aren’t the greatest, what they reveal is relatively promising. The spot that you see above seems to be the worst that can be seen, while there also appears to be some small amounts around the trunk opening. Otherwise, the car has survived its ordeal-by-chicken fairly well. The interior hasn’t survived as well as I would have hoped, but it is largely complete. The door trims look like they may be okay, and it looks like the original 8-track player is still present, although the radio is gone. The distinctive gold-spoked wheel which was part of the Y82 pack is present but would need restoration. The car has a machine-turned fascia on the instrument panel, and this one is silver. The Y82 pack included a gold one as standard. The gold could occasionally wear away to reveal the original silver. That may be the case here, or it is also possible that the original gold fascia has been replaced at some stage. 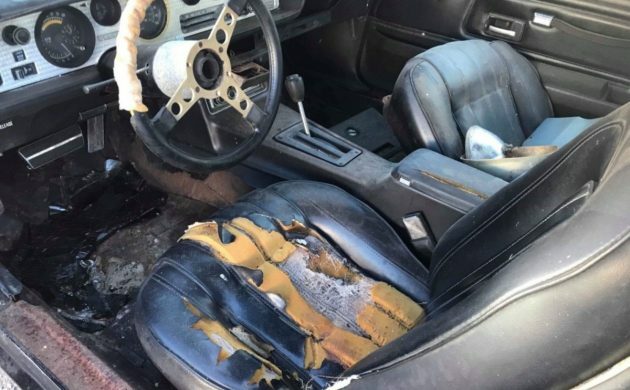 The car will also need a new dash pad, and the seats will require new covers. 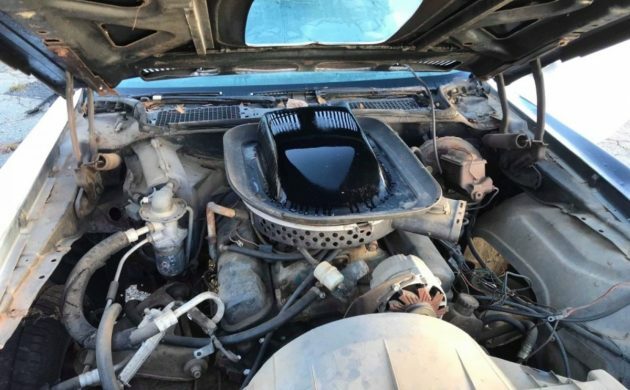 There is a 400ci V8 lurking under the hood, but unfortunately, it isn’t the numbers-matching unit. Being a 400 Y82, the transmission is an automatic, while the car is also fitted with power steering, power brakes, and air conditioning. The owner doesn’t give us any information on the state of the engine, so that is an unknown quantity, which is really frustrating. 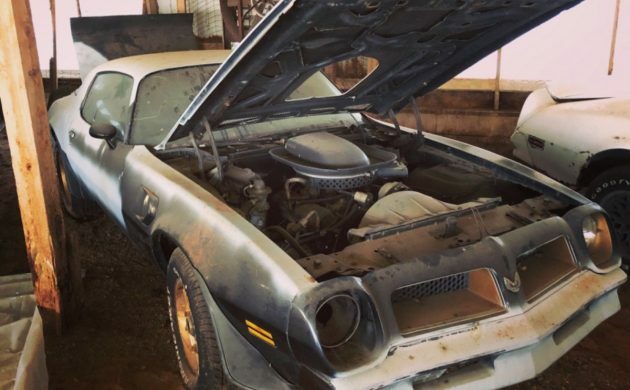 In 1976, Pontiac produced 2,590 Trans Ams fitted with the Y82 pack, and the most commonly ordered car was specified as this vehicle is, with 1,628 cars being built. That makes this car the most commonly configured Y82 that you can buy. 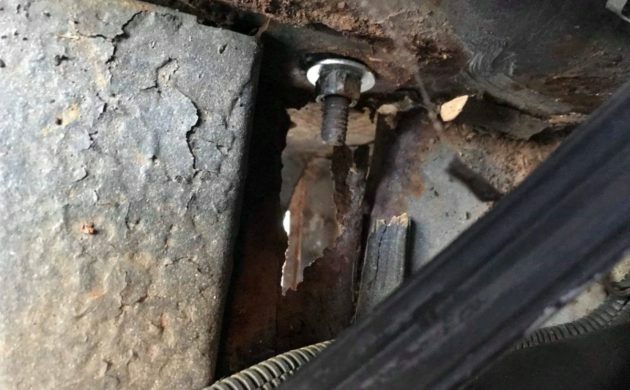 Rust issues in the car appear to be minimal, and it does appear to be largely complete. It is missing its original engine, and this will negatively impact its ultimate value. Bidding is currently sitting at $2,550, but the reserve hasn’t been met. It will be interesting to see what it finally sells for. They lost me at chicken coop. So sad to see this happen to once very cool car . They are among the coolest cars ever made, I am biased though as I do own a Y84. I have a friend who deals in these particular cars, I will quote the advice he gave me “Jeff, save your money and buy the best rust free original documented car you can find, youll be a lot of money ahead and avoid putting lipstick on a pig”. I took that advice for buying my Trans Am and a couple of other cars that I really wanted. 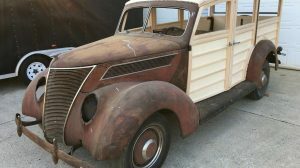 He was right as rain, even if you can do everything yourself, your still better off buying the superior car, unless of course, building the car is your thing, then have at it, I like em “without a scab of rust and all original panels”. I hope whoever buys this understands the concept and consequences of being under water and as Jeff mentioned earlier, “Building the car” is their thing. Did I miss something here? Looked at Ebay pics. Why is the ID plate screwed to the car? They were tack welded until the late 60s I believe, maybe into the 70s, then riveted after that. Am I wrong? @mark houseman – Can you send in more photos and a story so we can feature it on the site? Thanks! 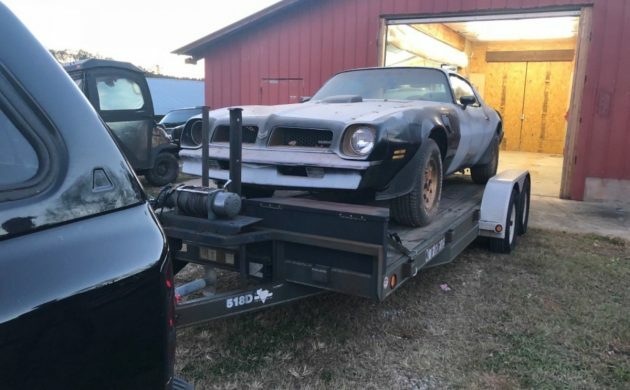 Hey Jesse…………I would love to share more pictures but have sent some others to you/your site and never heard back from any one………so I’m not sure I’m sending them to the right address…..
Around 1992 I pick up a 1976 TA with 455 and 4- speed for 800.00. While driving out of town one afternoon an off duty policemen (didn’t know at the time) driving a 67 Mustang started to mess with me. He would drive up fast and get close, turn back and forth. I would keep going a little faster, and then he thought he would pass me- NOT, I dropped a gear, stepped on it, hit forth for a little bit, then coasted for about half a mile untill he caught up to me. He was all pissed off, Yelling you’re lucky i’m not on duty, You were going 130 plus blah, blah, blah I just smiled and drove away.